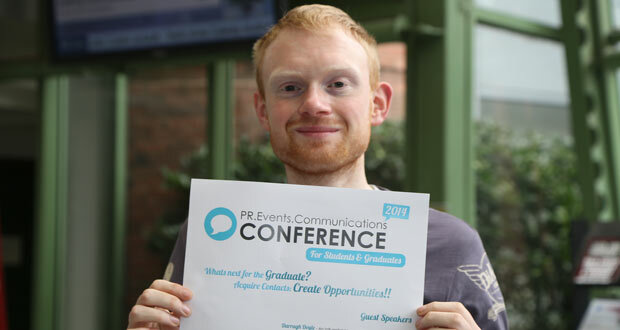 Stephen Hanlon, a student from Wicklow town in Dublin Institute of Technology (DIT), has been given the honour of organising the first ever DIT PR, Event Management and Communications Conference. Stephen is studying toward a Masters in PR and was selected by his fellow classmates and members of the Public Relations and Public Affairs (PRPA) Society committee. The conference will be held on on Friday, March 28 in the DIT Aungier Street Campus. The conference aims at assisting postgraduate and final year students in achieving a better understanding of the options available to them upon graduation, as well as providing them with a whole host of contacts who can guide them towards perspective job opportunities as they become available. “The sheer volume of young people, many of them students, leaving Ireland is frightening. They graduate from college and struggle to find employment,” Stephen said. “We want this conference to be a way of showing these students that there is indeed work out there if you can acquire the right contacts and that leaving isn’t always the best option,” Stephen explained. Journalists, PR professionals, and directors from some of the country’s leading businesses will all be present at the conference with each providing students with their expertise and guidance to make sure that everybody in attendance leaves satisfied about their future prospects. These are set to include Irish Independent news editor Liam Collins, PR academic and author Ellen Gunning, and Director of Marketing at Arnotts Louise Conlon to name but a few. Tickets for the event are expected to sell out quickly but are still available on the EventBrite website and in DITSU shops at a cost of €5 per student and €10 for non-students. Lunch is included in the price.